Upon arrival at the lodge, guests are warmly greeted with a welcoming drink before being escorted to their guest chalet with private deck overlooking a lagoon. I arrived in time for lunch but spent a good hour just chilling out while watching wild life from my deckside perch. Giraffes are my favorite and I wasn’t disappointed. An elegant mother with two offspring glided across the terrain barely 50 feet away. Because of the chalet’s proximity to water, an endless stream of wildlife passes by. Sightings of wallowing hippos along with lions, zebras and giraffes along the lagoon’s shaded banks are common. Each of the 18 thatched chalets overlooks one of two lagoons where abundant game activity occurs both night and day. Seasonally, water in the park dries out causing local elephant, hippo, buffalo, even leopard and lion to make their way to the lagoon to drink. Game Drives: Morning and evening game drives optimize opportunities to view an abundance of wildlife. A typical morning drive sets off at first light. On our first morning out, we ended up calling Derek, our knowledgeable driver/guide “Eagle Eye” for his uncanny ability to spot animals camouflaged by brush or to point out bird life at every hidden nesting niche. That first foray alone garnered up close encounters with elephants, giraffe, spring bok, zebras and gazelle. A leisurely tea break punctuated the four-hour morning out before our return to the lodge where we wondered if elephants might be visiting reception for their breakfast too. Night Drives offer the best chance to see elusive leopards who often prefer the cloak of darkness. Zebras abound in the park and the Zambian herds are a special breed called Crawshay, distinguished by their thin stripes. Huge herds of buffaloes congregate here as well, often marching en masse to the river. to drink. Guests get thirsty at sundown too, thus the term “sundowner” stems from a break in the evening drive when the guide selects a choice photographic site where the group can enjoy a cool drink with which to toast the day’s events as an African sun sinks into the horizon. Once darkness falls, guides use spotlights to highlight the park’s cast of nocturnal players. 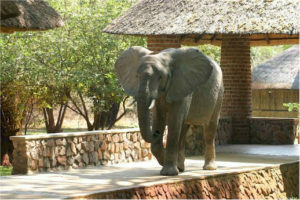 Safety and sensitivity to the environment permeate every aspect of life at Mfuwe. Due to the lodge’s proximity to the wildlife’s habitat, guests do not roam outside after dark. The lodge sponsors cultural visits to a local village, school and handicraft market. Be sure to keep your camera at the ready when you return to the lodge. You never know when hunger will bring the herd through. And just think. You are not at home so someone else will clean up. Reservations for Mfuwe Lodge, voted Best Lodge in Zambia, 2009: info@bushcampcompany.com or Mfuwe Lodge, P O Box 91, Mfuwe, Zambia. Getting There: South African Airways, Africa’s premier airline can arrange flights all the way from San Francisco International Airport to Johannesburg, South Africa and on to Zambia. Visit www.flysaa.com for details. Amazing! 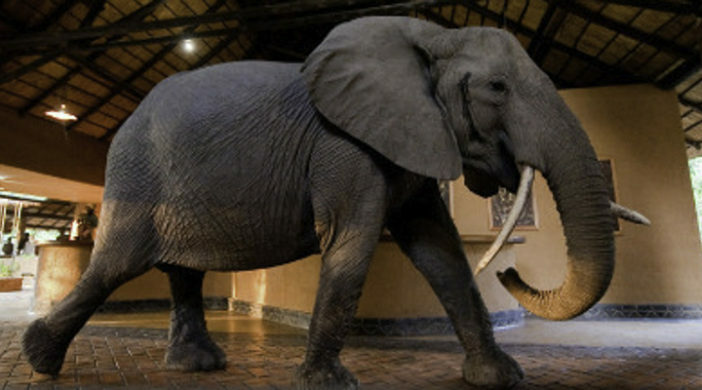 It seems great to watch elephants walking through a hotel.